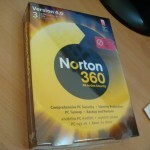 Symantec, on wednesday, launched it's security product, Norton 360 Version 4.0, here in India, and the rest of the world. This new version uses a 'reputation' based approach to tackle viruses, spyware, trojans and other threats including the web based attacks that target the social networking sites. Additional features include a better backup adding an option for online backup of data, which would allow the user to retrieve and download the backup files from anywhere and Norton Download Insight which tells you whether the application is safe before you run or install it. Another feature that is included in this suite is the Smart Start-up Manager which, according to David Hall, Regional Product Manager, Asia Pacific, can reduce the boot time by 30-40% on Windows 7 systems. Symantec is marketing this product as an All-in-One security solution, which basically means you don't need to install additional firewall software, or start-up manager or PC-tune up utilities. This suite, according to Symantec, can be used as a single solution to all the protection that a PC needs these days. It can also be considered as a combination of Norton AntiVirus and the Internet Security and other additional features like Online Backup and Norton Download Insight which make it a better security solution as compared to Norton Internet Security. Symantec also plans to launch security applications for the smartphones to tackle the mobile malware, which, some experts believe is going to be the next big hurdle for the security solutions companies. Beta apps for the Android and apps for the iPhone and iPad are expected to be launched in the coming weeks. Pricing: US$79.99 for the standard edition including 2GB of online storage space and US$99.99 for the premium edition including 25GB of online storage space and the online storage space is the only difference between the two editions. Norton 360 version 4.0 is now available for purchase in the India through retailers and the Symantec online store at buy.norton.com (choose India from the country menu). The price for both standard and premium editions includes a one-year service subscription to use the product and receive Symantec's protection updates. All Norton 360 users with a valid product subscription are eligible to receive the latest product updates via the subscription service model.